It is well known that aerobic exercise training enhances cardiac baroreflex function and lowers arterial blood pressure. As discussed in previous posts, the impact of exercise training on cerebral hemodynamics remains ambiguous. I once wrote a post over at Scientopia describing a study that reported a less effective dynamic cerebral autoregulation (measured by the thigh cuff method) in rather fit subjects. Interestingly, evidence suggests that cardiac baroreflex function is inversely related to dynamic cerebral autoregulation. 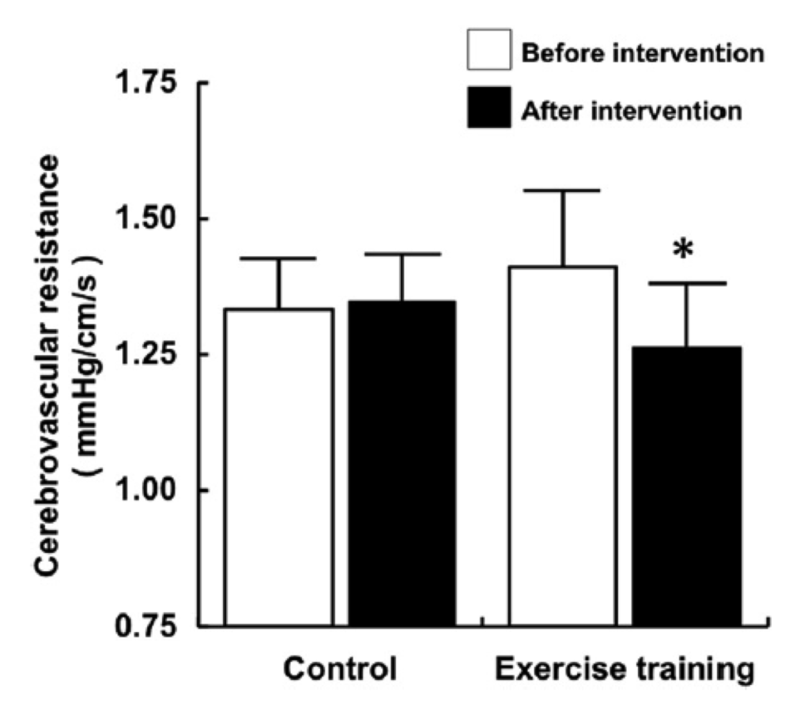 Could exercise training lead to a deterioration of dynamic cerebral autoregulation notwithstanding the known benefit for cardiac baroreflex function ? A new and very interesting study by Aengevaeren et al. investigated the influence of lifelong exercise (comparing 11 Masters athletes (73±6 yrs, aerobic training >15 yrs) and 12 healthy sedentary elderly (71±6 yrs)) on cardiac baroreflex function and dynamic cerebral autoregulation. Baroreflex function and dynamic cerebral autoregulation were assessed using transfer function analysis of spontaneous changes in systolic blood pressure and R-R interval in the low frequency range (0.05-0.15 Hz) and during sit-stand induced changes in mean blood pressure and cerebral blood flow velocity at 0.05 Hz (10s sit, 10s stand), respectively. The Masters athletes had a better cardiac baroreflex function but dynamic cerebral autoregulation was similar compared to sedentary elderly. In addition, there were no correlations between cardiac baroreflex function and dynamic cerebral autoregulation. These results are in contrast with findings from that study suggesting a less effective dynamic cerebral autoregulation in fit volunteers. Confounding factors, such as the limitations of cross-sectional study, differences in the study population as well as the uncertainty about a potential dose response relationship of exercise training and CBF regulation all may have contributed to these inconsistent findings. However, the present study provides evidence that dCA was not compromised in the Masters athletes who had participated in lifelong endurance exercise training. I am wondering if similar results would have been reported if the authors used the thigh cuff method in order to induce an important reduction in mean arterial pressure…We now need a well-designed intervention study to elucidate the impact of aerobic exercise training on dynamic cerebral autoregulation in athletes ! Aengevaeren VL, Claassen JA, Levine BD, Zhang R. Cardiac baroreflex function and dynamic cerebral autoregulation in elderly masters athletes J Appl Physiol 2012. Epub ahead of print. 38- Are hand-held TCD measurements acceptable for estimates of CBFv? – Saeed et al. 39- Kinetics of exercise-induced neural activation; interpretive dilemma of altered cerebral perfusion – Miyazawa et al. 40- Regulation of Cerebral Blood Flow – Petersen et al. As you may guess, I was really interested in the impact of endotoxemia on the cerebrovascular physiology. Endotoxemia/sepsis is usually associated with reduced cerebral blood flow. Static cerebral autoregulation can be altered or can be intact in septic patients. However, at the moment of the study, the influence of endotoxemia/sepsis on dynamic cerebral autoregulation remained unknown (since then, another paper reported data on dynamic cerebral autoregulation). Our group of research considered that a reduction in PaCO2 (induced by hyperventilation associated with endotoxemia/sepsis) would attenuate cerebral blood flow/cerebral blood flow velocity and improve dynamic cerebral autoregulation in these subjects following the administration of endotoxin. So, we studied systemic hemodynamics, cerebral blood flow velocity, and dynamic cerebral autoregulation (by transfer function analysis) in healthy volunteers before and after an endotoxin bolus. In these healthy volunteers, in whom cerebrovascular reactivity to CO2 seemed intact, endotoxemia was associated with reduced PaCO2 and cerebral blood flow velocity and with improved dynamic cerebral autoregulation. This “improvement” in dynamic cerebral autoregulation, that is the capacity to restore cerebral blood flow within seconds following acute changes in arterial pressure that are transmitted to the cerebral circulation, is really important for patients with sepsis, especially within a context of low mean arterial pressure. Aerobic exercise training is known to have beneficial impacts on numerous body functions. It’s the best pill on the market ! 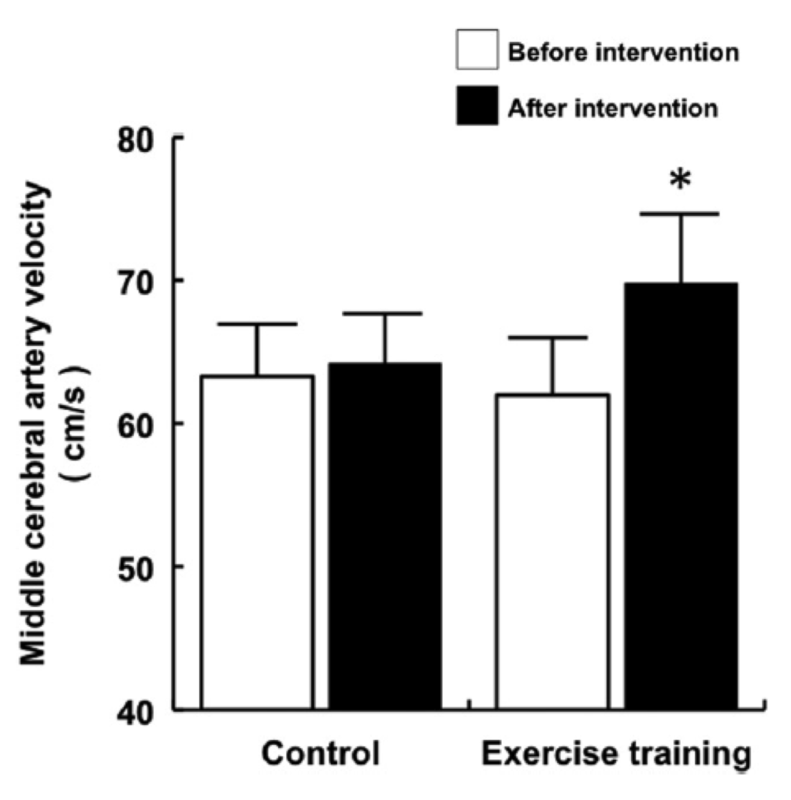 However, although a high aerobic fitness seems to be associated with higher cerebral blood flow in trained individuals vs. sedentary subjects (cross-sectional study), the influence of aerobic exercise training on cerebral blood flow remains ambiguous. A recent study investigated the effects of 8 weeks of aerobic exercise training on cerebral blood flow velocity in post-menopausal women. Exercise training consisted in walking/cycling 3-6 days/week, 30-60 min/session at an intensity of 60 to 75% of maximal heart rate. A control group did not change their physical activity level during these 8 weeks. Cerebral blood flow velocity in left and right middle cerebral arteries (transcranial Doppler), cerebrovascular resistance, arterial blood pressure (photoplethysmography), and blood biochemistry parameters were measured before and following aerobic exercise training. The figures below show the main results of this study. As you can see, blood flow velocity in the middle cerebral artery increased while cerebrovascular resistance lowered after 8 weeks of aerobic exercise training. The authors suggest that both structural (angiogenesis) and functional (improvement in endothelial function) changes in the brain vessels following aerobic exercise training could explain this elevation in cerebral blood flow velocity. Since PaCO2 and cardiac output are important determinants of cerebral blood flow, it could have been interesting for the authors to include these measurements…especially cardiac output if they used the Finapres to measure arterial blood pressure ! But anyway, this is a good start and we definitely need to conduct further studies to better understand the impact of aerobic exercise training on cerebral blood flow ! 35- Cerebral desaturation events in the intensive care unit following cardiac surgery – Greenberg et al. 36- Transcranial Doppler velocities in a large, healthy population – Tegeler et al. 37- Initial orthostatic hypotension and cerebral blood flow regulation: effect of α1-adrenoreceptor activity – Lewis et al. 32- Cerebral Near-Infrared Spectroscopy in Adults: A Work in Progress – Ghosh et al. 33- Utility of transcranial Doppler ultrasound for the integrative assessment of cerebrovascular function – Willie et al. 34- Effect of acute hypoxia on blood flow in vertebral and internal carotid arteries – Ogoh et al. 30- Middle cerebral artery blood velocity during running – Lyngeraa et al. 31- Cardiac baroreflex function and dynamic cerebral autoregulation in elderly masters athletes – Aengevaeren et al.